Born in Minsk, Russia, as a child Kantor moved with his family to the United States in 1906. He made his home in West Nyack, New York, for much of his life, and died there in 1974. Kantor found employment in the Garment District of New York City, beginning his formal art studies in 1916 at the Independent School of Art where he studied with the landscape painter Homer Boss. Like many American artists, he travelled to Paris in the 1920’s to work and absorb the emerging tenets of modernism. His circle of fellow artists there included sculptor Isamu Noguchi. During the 1930s He was appointed supervisor of the Federal Art Project's Easel Painting Project in Rockland County, New York. In the 1940s he was an instructor at the renowned Cooper Union, and also at the Art Students League of New York. He married fellow artist Martha Rhyther. summers were spent painting in Monhegan, Maine. He continued sketching and drawing through the 1970s, until shortly before his death. The artist's most widely recognized work is perhaps the iconic WPA painting "Baseball At Night", which depicts an early night baseball game played under artificial electric light. And although best known for his representational paintings, he produced a large and stylistically diverse body of work spanning the influences of Cubism, Futurism, Surrealism and abstract expressionism. Kantor's work is included in many important museum collections including: Metropolitan Musuem of Art, Museum of Modern Art, Art Institue of Chicago, Pennsylvania Academy of Fine Arts, Smithsonian American Art Museum, and Hirshhorn Museum. 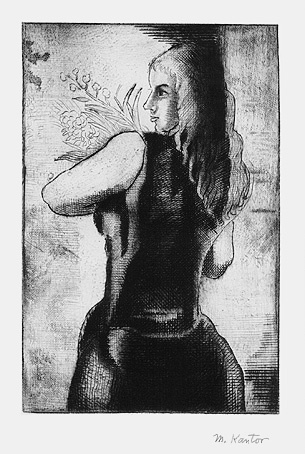 Woman with Flowers - - c.1930, Etching. Image size 8 7/8 x 5 7/8 inches (225 x 149 mm); sheet size 12 5/8 x 10 inches (321 x 254 mm). A fine, rich impression, on cream wove paper, with full margins (1 1/2 to 2 1/4 inches). A repaired tear in the top right sheet edge, well away from the image, otherwise in excellent condition.